1. Café Pascal - In January, it won the prestigious Gulddraken award for best café in Stockholm. The croissant with egg mayo and parma ham was delicious. The flakiness and butteriness from the croissant went well with the creaminess from the egg mayo and the saltiness from the parma ham. In contrast, the cinnamon roll was a bit too hard and lacked cinnamon flavour. Overall, it's a decent café but I wasn't blown away. 2. Karla Café - This was nearby our Airbnb, so we decided to give it a try and we're so glad we did because the food was tasty. Although it may not look like much, the egg sandwich was delicious. This was mainly due to the shrimp flavoured mayo, which went well with the soft boiled eggs. The blueberry crumble was crispy on the outside and gooey on the inside. There were lots of blueberries, and the cream was light and not too sweet. The chai latte was good too. Overall, I was impressed with the food: it's not groundbreaking but you can taste the quality and flavours. My only gripe is that the prices are quite steep, considering how small the portions are. 3. Muffin Bakery - We arrived in Stockholm the day after the Midsummer's Eve, so most of the shops and restaurants were closed. 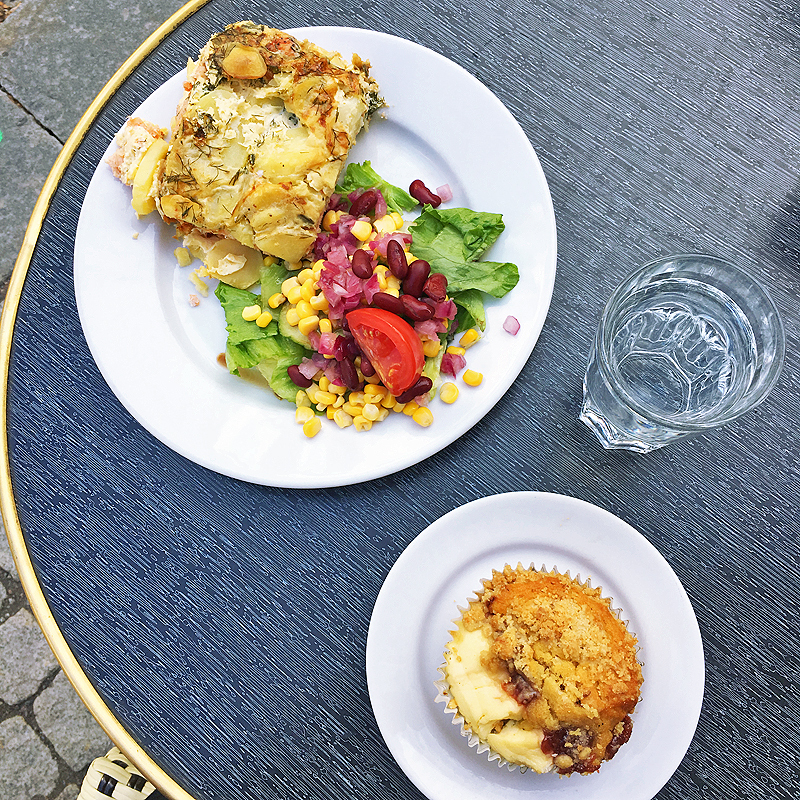 We stumbled upon Muffin Bakery while looking for a place to grab a late lunch. The salmon pudding consisted of smoked salmon, potatoes, eggs and cream. I thought it was too dry and salty. Since the place is named Muffin Bakery, I thought I should try a muffin. I had a hard time choosing one because there were many flavours available, but I finally settled on a strawberry cheesecake muffin. Instead of a muffin that incorporates cheesecake elements, it was more like half a cheesecake stuck together with half a muffin. The cheesecake was dry and bland. However, the muffin was moist and with a nice crumb. 4. 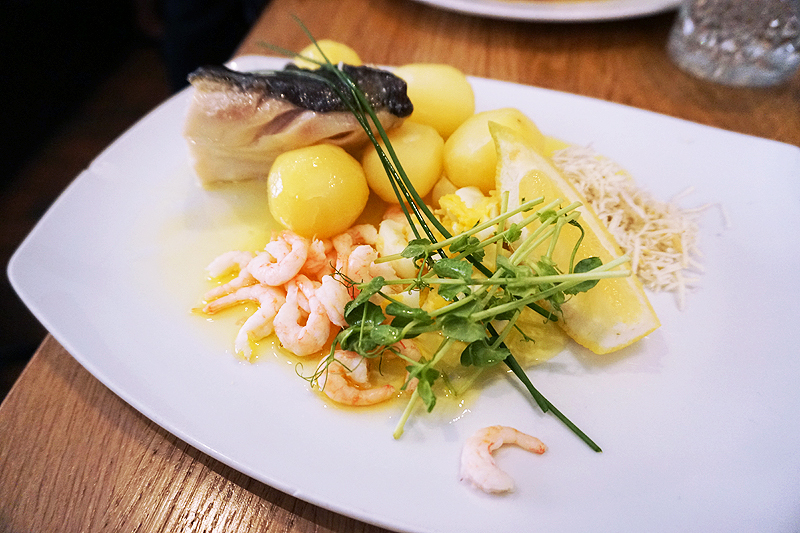 Gästabud - This is a small restaurant serving traditional Swedish food in Gamla Stan (Old Town). The cod tasted like it was boiled instead of steamed: rubbery and overcooked. Despite the melted butter, the dish tasted quite bland. On the other hand, the meatballs were so tasty. They were juicy, tender and perfectly cooked. The gravy was rich and creamy. 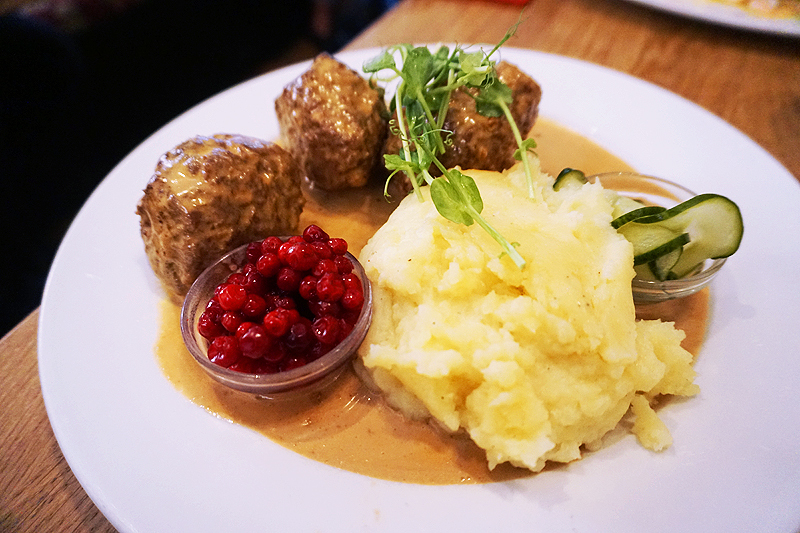 I like how the meatballs were served with whole lingonberries instead of lingonberry jam. The lingonberries added some tanginess that cut through the richness and creaminess of the gravy. The mashed potatoes were buttery and literally melted in my mouth. As much as I like Ikea's meatballs, nothing beats homemade meatballs. 5. Günters - This is a small hot dog stand in Vasastan. All the other customers were male and mostly locals, so we, being two Asian girls, stuck out like a sore thumb. There were lots of sausage options and I chose chorizo. The sausage was juicy and flavourful. It went well with the sauerkraut and sauces. The only thing I didn't like was the baguette as I prefer soft hot dog buns. Nevertheless, it was a delicious hot dog and a big portion too. 6. 7-eleven and Pressbyrån (not pictured) - Convenience stores across Stockholm also sell hot dogs and baked goods if you're in need of a quick, convenient and cheap meal. 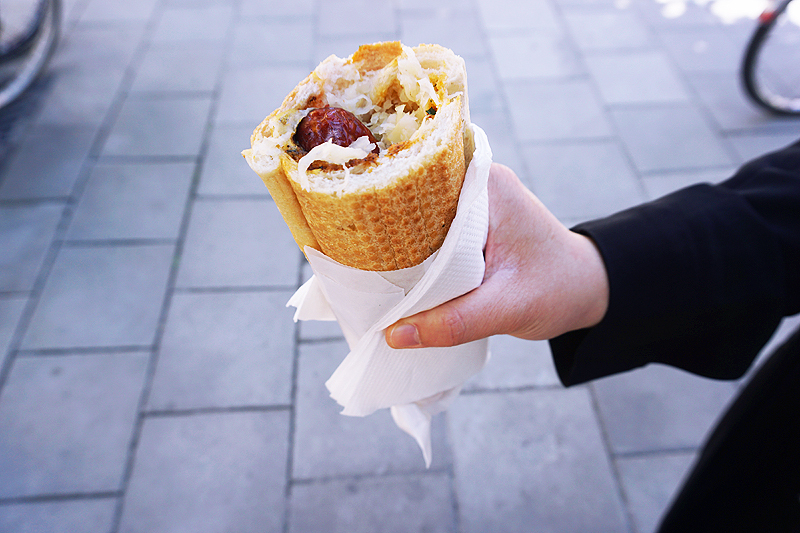 I personally prefer Pressbyrån's hot dogs over 7-eleven's. 7. 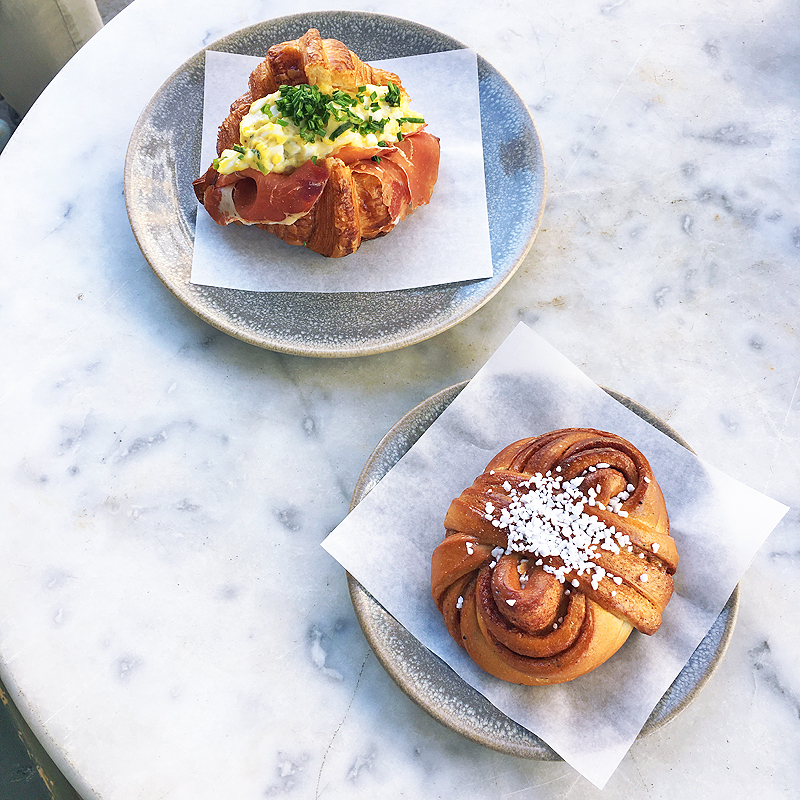 Valhallabageriet - I ate my weight in cinnamon buns/rolls across Copenhagen, Stockholm and Oslo, and Valhallabageriet's one was my favourite. It was light, fluffy, soft and had the right amount of sweetness, which mostly came from the pearl sugar on top. The cinnamon flavour could have been a bit stronger, but that's just me nitpicking. The Summer croissant, a Summer special, was tasty too. It was crisp and flaky on the edges, and soft in the middle. The custard filling was light, creamy and not too sweet. The tanginess from the fresh strawberries elevated the flavours of the croissant. 8. 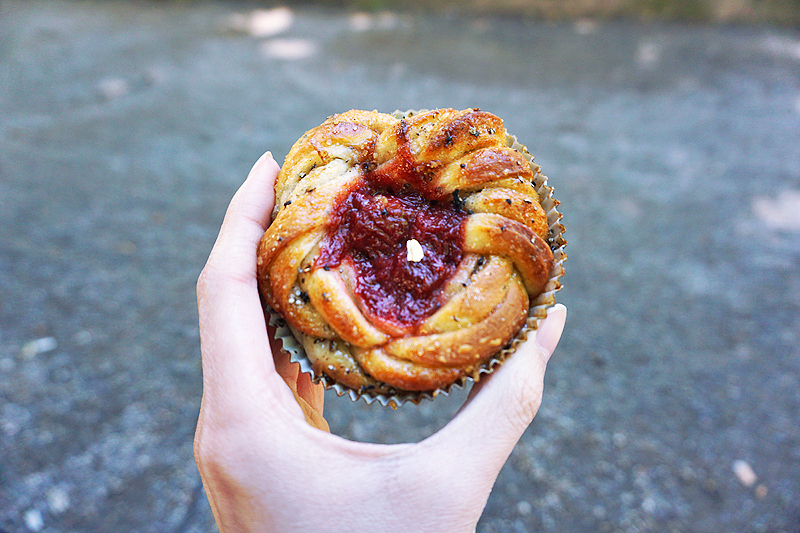 Bakery & Spice - Although their kanelbulle (24 SEK) failed to impress me, their månadens bulle, a cardamom bun with rhubarb and strawberry compote, really did. It had a sticky sweet glaze on top, which made the soft dough very moist. The combination of flavours was divine: tartness from the compote, sweetness from the glaze and spiciness from the cardamom. 9. 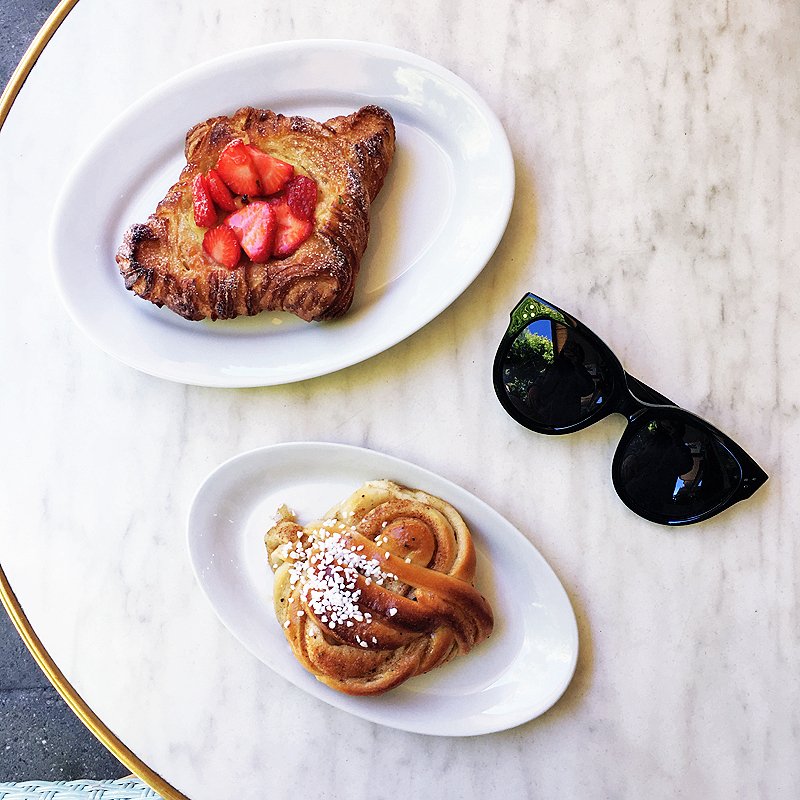 Gateau (not pictured) - Both their cinnamon and cardamom buns (30 SEK each) were underwhelming, so I'd recommend skipping them and going straight to Valhallabageriet. 10. 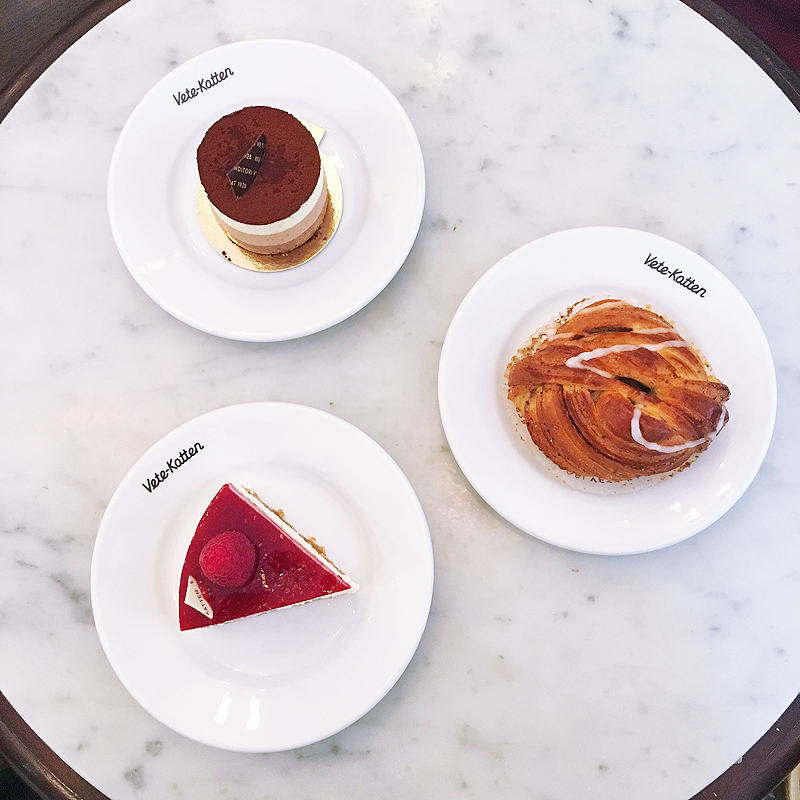 Vete-Katten - Fika means coffee break in Swedish and when I was in Stockholm, I probably indulged in fika too much (calories don't count if you're on holiday right?). 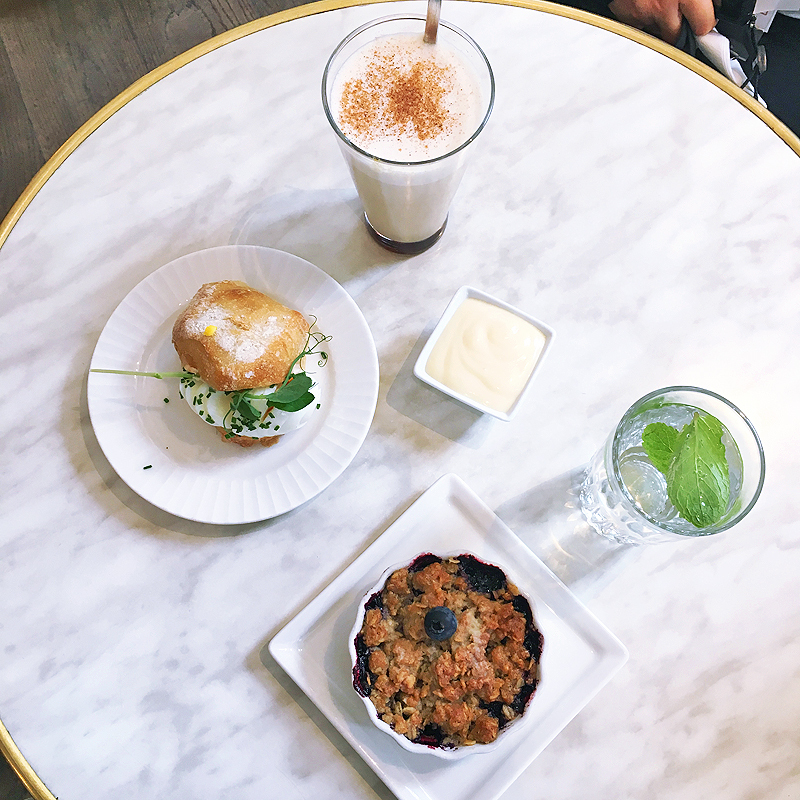 If you're in Stockholm and in need of a fika, head to Vete-Katten. The Trio consisted of three layers of creamy chocolate mousse (dark, milk and white), a crispy digestive biscuit base and a dusting of Valrhona cocoa powder. It was rich and chocolate-y while still being light and smooth. The vanilla bun was decently soft with a light, smooth and creamy vanilla custard filling. The white chocolate cheesecake was rich, smooth and creamy with a crispy digestive biscuit base and a tart raspberry compote. 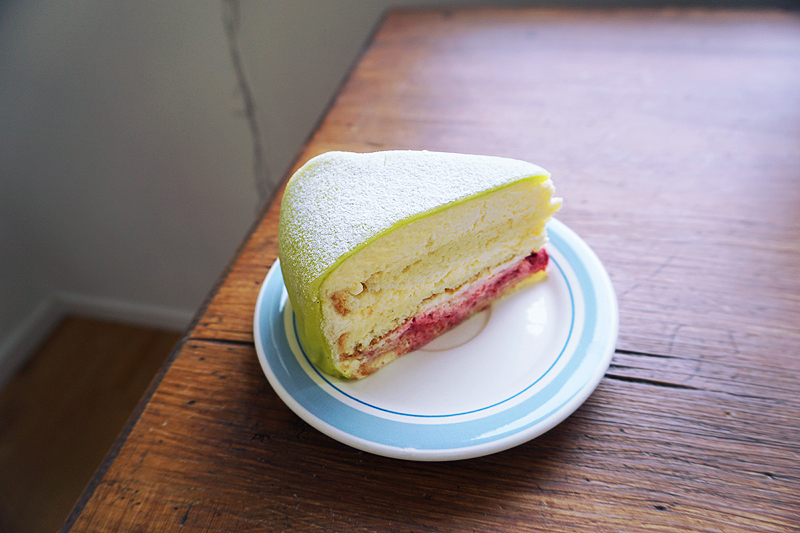 Vete-Katten was so good that we went back to try to their Princess Cake. It's a sponge cake layered with custard, raspberries and whipped cream, encased in green marzipan and powdered with icing sugar. The cake was pretty light and fluffy. The marzipan was surprisingly soft (for some reason, I was expecting it to be hard like fondant) and not too sweet. Overall, it's a decent cake but I prefer the above three.